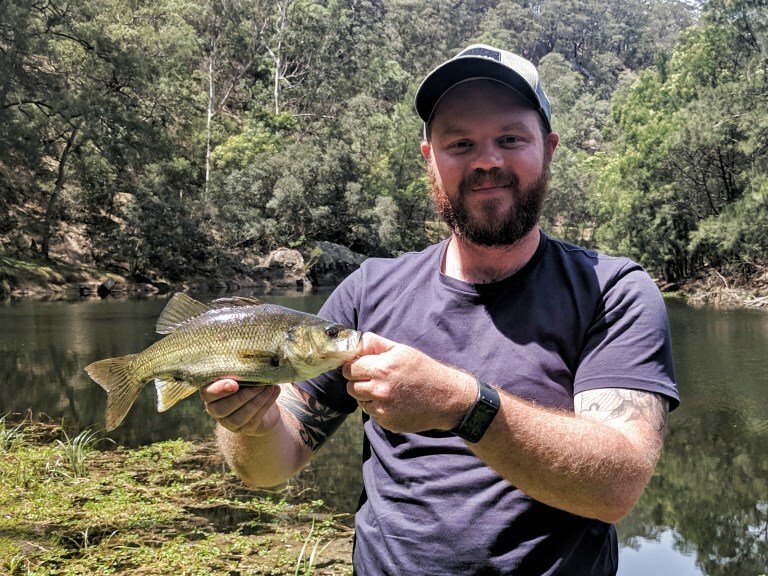 We’re calling on anglers to join us for an informal get together from 4pm on Wednesday 10th April at Gaden Trout Hatchery to discuss the NSW trout strategy. This is a great opportunity to meet DPI staff and for anglers to hear about new and ongoing research, enhancements to hatcheries, stocking and management arrangements and DPI/ angler communication. The event will begin with presentations from management and research staff after which anglers can tour the facilities and see demonstrations on research techniques such as tagging and electrofishing and participate in further discussions. The event will conclude by 6:30pm followed by light refreshments and you can join in at anytime throughout the afternoon. Please RSVP to Gaden Trout Hatchery on 6451 3400. This entry was posted in Archive on March 26, 2019 by bill. 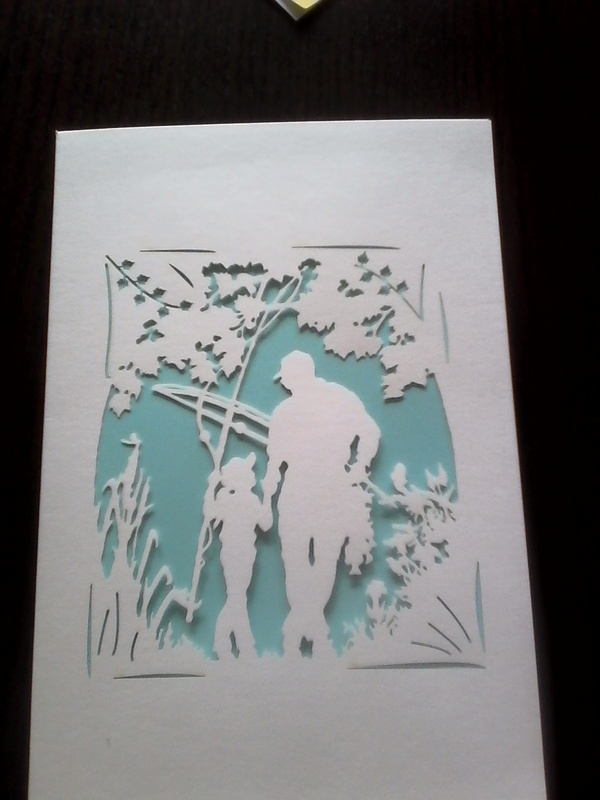 I received an update on the Ozfish Unlimited AUSTRALIA FLY FISHING FESTIVAL. Saturday 6th April Bruce Neale Drive Penrith, commencing 9am. 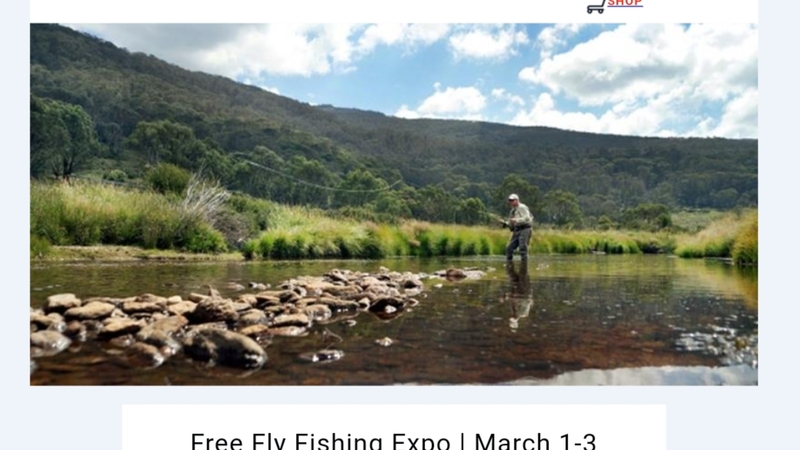 Juan Del Carmen, internationally renowned fly fisher, has organised the second annual AUSTRALIA FLY FISHING FESTIVAL and it’s still all FREE. The event has been moved to Saturday April 6th which will make the temperature very pleasant. 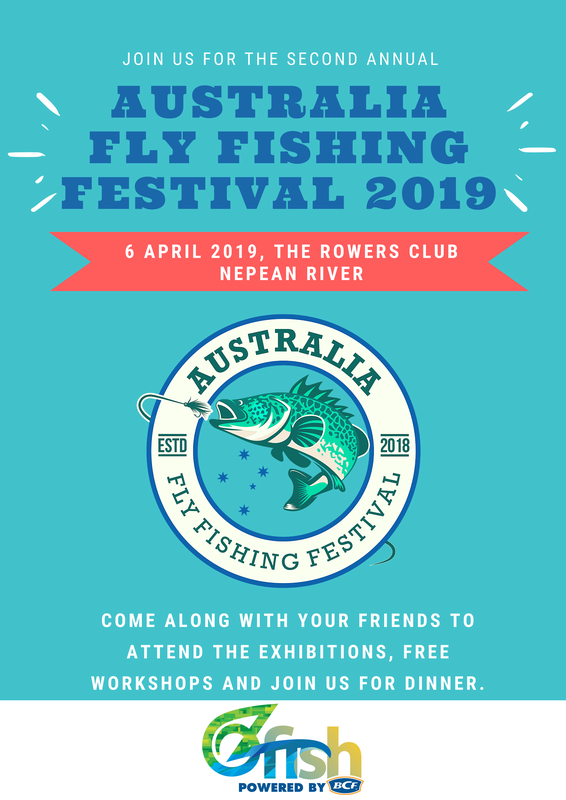 Maintaining the successful format of last year’s festival, a cast of excellent presenters will demonstrate and talk on subjects as diverse as blackfish on fly, making the cast work for you, wind, knots, guiding experiences, fishing Sydney and casting heavy gear. We expect at least ten separate presentations and workshops, both on the river and on the grass, plus a host of suppliers and industry experts to be on hand to answer your every question. Peter Morse MCI. Wildfish. Sage. Reddington. Cameron McGregor River Escapes. Vision. Josh Tredinnick Flyfishing movie director. Clinton Isaac Australian Fly Fishing Lodge. Scott. Royce Shanks discussing catching ludderick on fly. Jack Marss Australian Fly Casting Distance Champion. James Gay discussing two handed rods and casting. Juan del Carmen Advanced Fly Fishing School. Plus a quality raffle so bring your money with you. All proceeds raised will be used to fund next year’s event. Breakfast, lunch and dinner will be available from the Nepean Rowing Club’s PADDLES RESTAURANT as well as fairly decent coffee throughout. Lunch is scheduled from 12.30pm and dinner at 6pm for those who wish to enjoy some fly fishing comradery. This event is targeted at both the experienced and the novice, so the less you know, the more you’ll learn! Registration is free and is not essential but it makes my life easier via Eventbrite. Facebook will be updated as information comes to hand. Please feel free to phone Mark on 0428653080 or Juan on 0410935609 for further information. This entry was posted in Archive on March 13, 2019 by bill. Craig Daly and Matt Tripet are again running what is becoming an annual event up at Thredbo. More information here. This entry was posted in Archive on February 22, 2019 by bill. Seems Snowy 2.0 is seeking to avoid one required step in the approval chain. They are seeking to get exemption from a review of its value for money. I wonder if the departure of Malcolm Turnbull will also have an impact. For those who need a broad description of the project, you might read this from the ABC. For those new to this matter, trout anglers are concerned about the potential to impact on trout in Lake Tantangara (and possibly elsewhere). This includes to potential for redfin to be pumped up to Tantangara from Talbingo and predate on trout. Monaro Acclimatisation Society is negotiating remedial action with Snowy Hydro. This entry was posted in Archive on November 13, 2018 by bill. On my way back from the coast, I decided up pull up for break and have a quick flick on the river at a particularly ‘fishy’ looking pool. I was lucky enough to land 3 bass, all around the 30cm mark and dropped a couple more. I could only stay for half an hour so I’m definitely keen to get back there and spend some more time exploring the area. This entry was posted in Archive on November 9, 2018 by bill. Update on Lake Wallace progress. Seems NSW anglers have similar access rights to water as those found in NZ … I will await with interest to see what that really means. Much has been said to me about the “Queen’s Chain” alongside rivers in NZ. 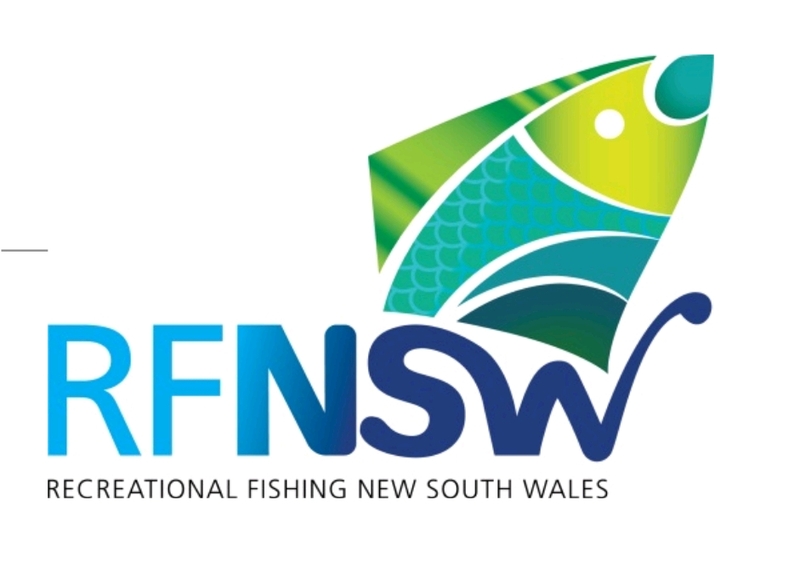 Chair of RFNSW is to “write to Snowy Monaro Regional Council about facilitating opportunities for recreational fishing access and stocking Trout at Lake Wallace near Nimmitabel.” There has been a response already – unfortunately not positive. Steve assures us that MAS is still on the case. This entry was posted in Archive on October 31, 2018 by bill. Some interesting observations on how the brown trout run progressed – somewhat encouraging but less so for rainbows. The issue of cormorants and pelicans in the trout breeding areas has been raised with the environmental department – let’s see what transpires. Waterwatch is again looking to us report. The report can be submitted on line. A good discussion in the Canberra Times. This entry was posted in Archive on October 4, 2018 by bill. 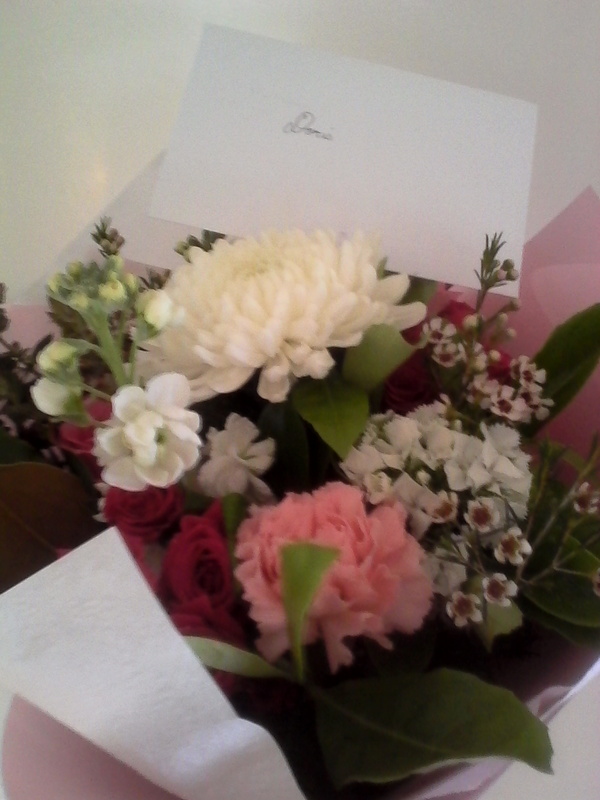 We have learnt that Bryan’s funeral has been arranged at the Norwood Park Crematorium 2pm Wednesday 3rd October 2018. This entry was posted in Archive on September 25, 2018 by bill. 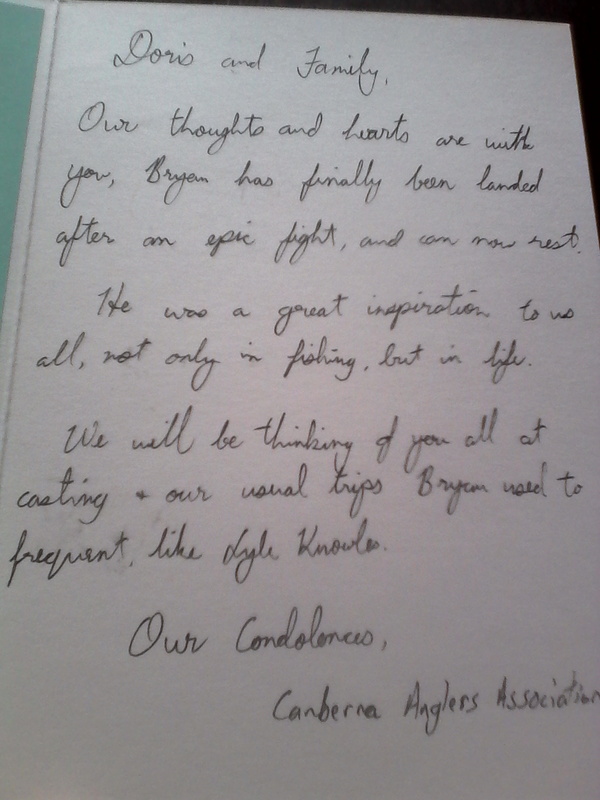 It is with sadness that we have received news of Bryan’s passing. 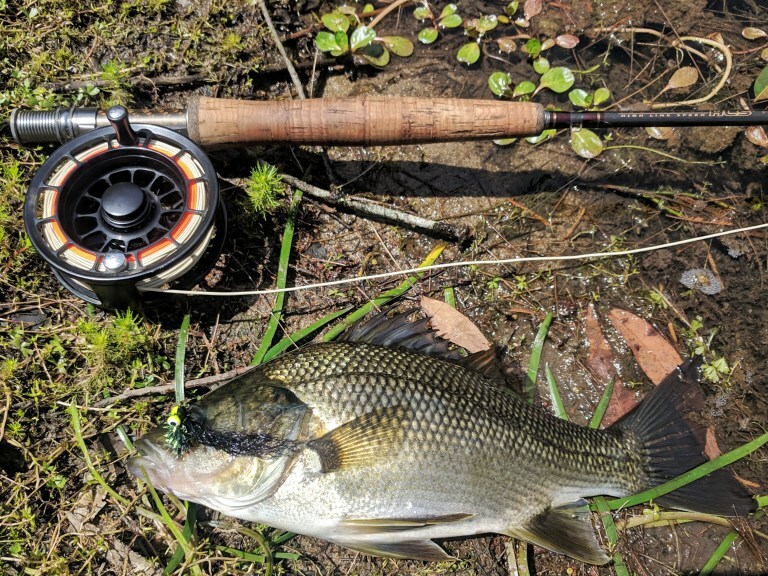 Bryan was a long term member and ongoing supporter of Canberra Anglers. He served as president about 50 years ago and spoke about our second decade during our 60th anniversary dinner. CAA granted life membership in 2013 – a photo of him receiving the certificate is in the Sep 2013 Burley Line . A tribute piece is in the Canberra Times. Bryan was a noted raconteur and his stories and ready advice will be sorely missed. This entry was posted in Archive on September 22, 2018 by bill.